Intel has combined a Wi-Fi transceiver with a dual-core Atom processor, opening up the possibility of slimmer mobile devices with longer battery life. The company plans to present its new chip, codenamed Rosepoint at ISSCC 2012 in San Francisco later this week. With fewer separate chips, mobile devices like phones, tablets and laptops could be slimmer, less battery-intensive and even cheaper. Radio components like Wi-Fi chips are especially difficult to miniaturise as they're usually based upon complex analogue circuitry. Intel has managed to buck this trend by producing a digital Radio Frequency (RF) which can be shrunk as chip parts become smaller. 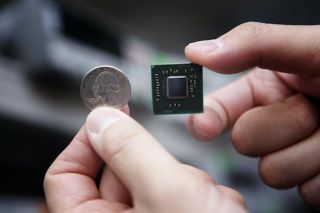 Intel's chief technology officer, Justin Rattner, says the chips will have "state of the art power efficiency," and that "with a digital approach to radio, you can bring the benefits of Moore's law to RF and radio circuits." The Rosepoint design puts a digital 2.4GHz Wi-Fi chip right next to a dual-core Atom processor in a mobile system-on-a-chip design. There are difficulties in combining wireless radio and CPUs, however, as both can emit disruptive radiation. "This radiation seeps into the RF module and corrupts the data," says Hossein Alavi, director of Intel's Radio Integration Lab. "The closer they are, the more interference is going to go to them." To get around this, Intel has developed noise-cancelling and radiation-shielding measures to apply to the chips. It even has chips with antennas included in the works. Currently the subject of a research project, the new chips could feature in mobile tech by 2015.